Important data from the US Labor market is coming up and this is how I see the possible move here. The pair reached 1.1380/90 yesterday, the level which I mentioned as an possible resistance in my EUR/USD analysis from the begining of the May 07. The sellers were ready there and they returned the pair down true the 1.1280/300 support, all the way to 1.1181 where the pair took a brake for now. NFP and US Unemployment Rate data is coming up in about an hour (12:30 h GMT) and I made this possible move after the data. If numbers will be better, US dollar could be boosted and pair could return to the 1.1000/50 support, where the buyers are waiting. Could they defend that level? It’s possible, after wich the buyers could form this H&S latter. If the numebrs from the Labor market fails, EUR/USD could be boosted up to 1.1380/90 again. 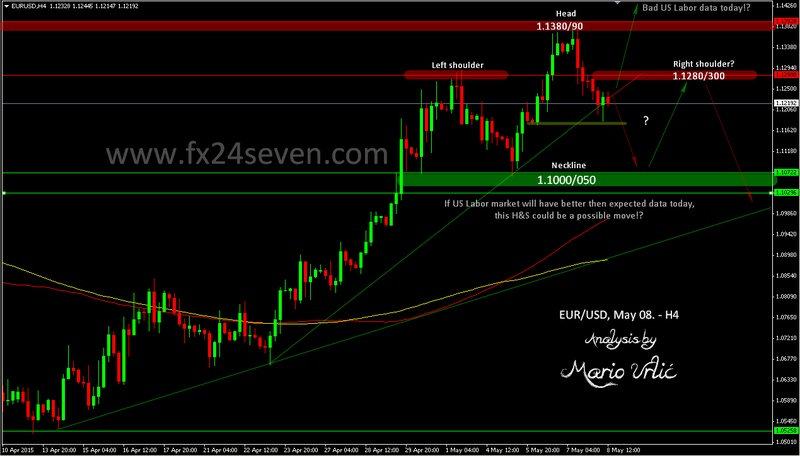 EUR/USD has returned in my predicted consolidation range from May 06. Be careful and don’t trade NFP if you dont’t have enough experience! Sharp up/down moves are possible! NFP numbers are in the line of expetations 223K vs 224K. Much better then previous data which were revised to 85K, but not strong enough for sharp usd move. Unemployment rate stays at 5,4%. That’s not bad for the usd at the end, but EUR/USD is undecided where to go.